Dance floors add a special touch to any reception or party. 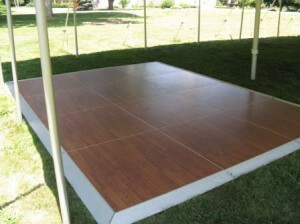 We can install a dance floor big or small to fit any size special event. Dance floor pricing includes installation. Outdoor installation must be weather protected preferably under a tent. Soft ground installations ( over grass or lawn ) include a sub-floor to provide the best possible dance floor experience.